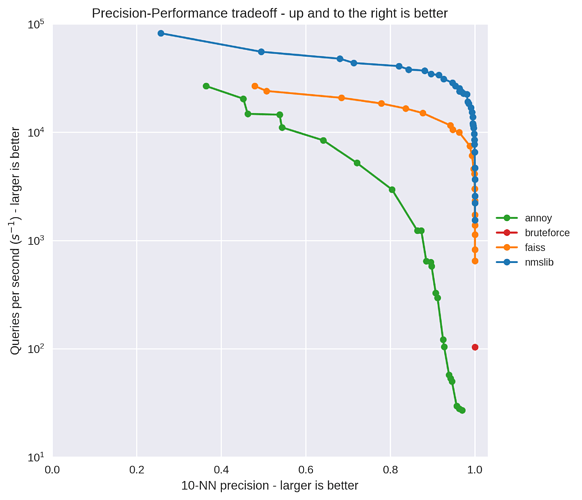 This is fast approximate nearest neighbors…the guy who built the nearest neighbors for spotify, also invented a method called annoy benchmarked all these methods - nmslib is the most incredibly fast way to find nearest neighbors in high dim vector space. The other way to do this is k-means clustering (or even better, vector quantization) - but for this example, fast approx KNNs work really fast. this devise thing was magical! Personally, I enjoyed the last 20minutes like anything. The ease and the elegance with which the concept was explained and the simplicity of the implementation with what we already know from fastai library was quite phenomenal. 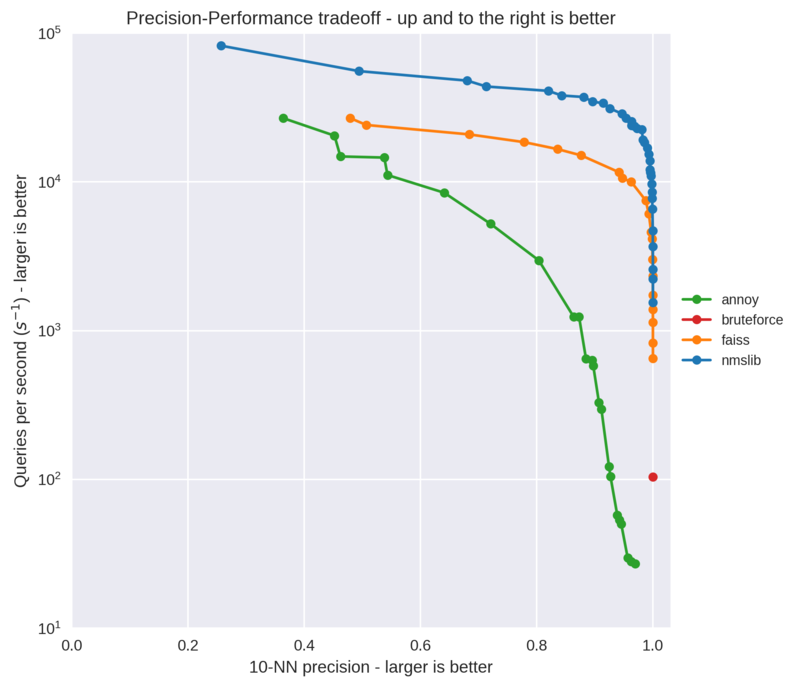 On the approximate nearest neighbors front, a friend has a great blog post outlining the tradeoffs of precision vs performance that’s definitely worth checking out. This post is about evaluating a couple of different approximate nearest neighbours libraries to speed up making recommendations made by matrix factorization models. In particular, the libraries I'm looking at are Annoy, NMSLib and Faiss. One thing that’s worth noting is that if you’re building a production system FAISS on GPU is an order of magnitude faster than NMSLib. NMSLib runs at 200,000 QPS (Queries per second) in batch mode on the CPU (Core i7-7820x), and the GPU version of Faiss runs at 1,500,000 QPS on a 1080ti. Faiss used to be a pain to setup but I believe they recently added pip support. I’m not sure if that includes the GPU aspect, but it’s worth considering if you need to do this at scale. The validation set doesn’t need to backprop, so it uses have the memory, so we can use a bigger batch size to run it faster. Without a 2nd linear layer it’s just a linear model, not a neural net! Does anyone know the original attention paper that jeremy discussed…i think i missed that…he was mentioning 2 papers useful to read ?? Is there anything preventing attention from being used in language models? There is an “attentive language model” paper that claims good results. I haven’t tried it. Yup. Rather foolishly I think they’re both required params, which isn’t ideal! Can I ask a favor - the top wiki post hasn’t been edited yet, but there’s lots of good links and resources in the replies here. If anyone has a moment would you be so kind as to add them to the top post? I need to go to bed! Thanks for a great class, Jeremy! Fish-in-nets : I’ve been waiting forever to hear you speak about DeVise again! Why not cluster the data set. That’s the point. I think the limit set for the loop is longest sentence length possible, so it will never truncate before EOS. Jeremy mentioned in the video we can now download has the link from Kaggle. Does anyone have the link? I can find the object detection challenge but not the usual classification challenge.